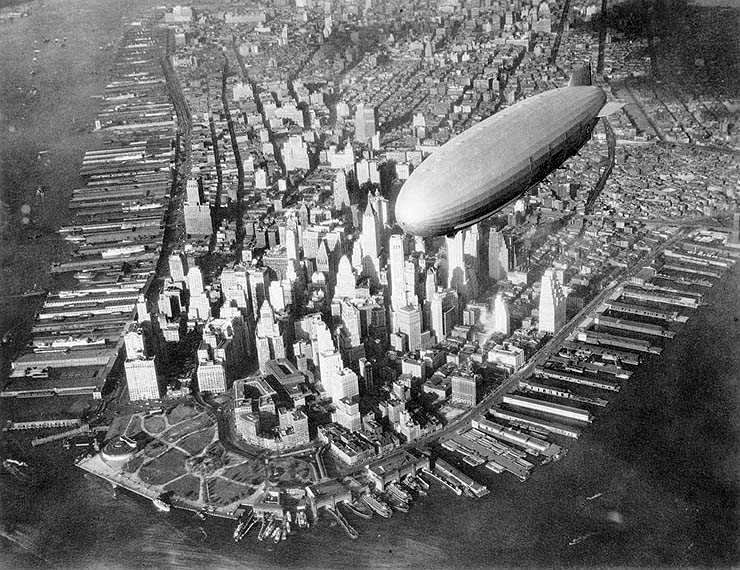 I will be collecting vintage shots of planes and dirigibles and, well, anything else flying over New York City on this page as I happen to come across them. 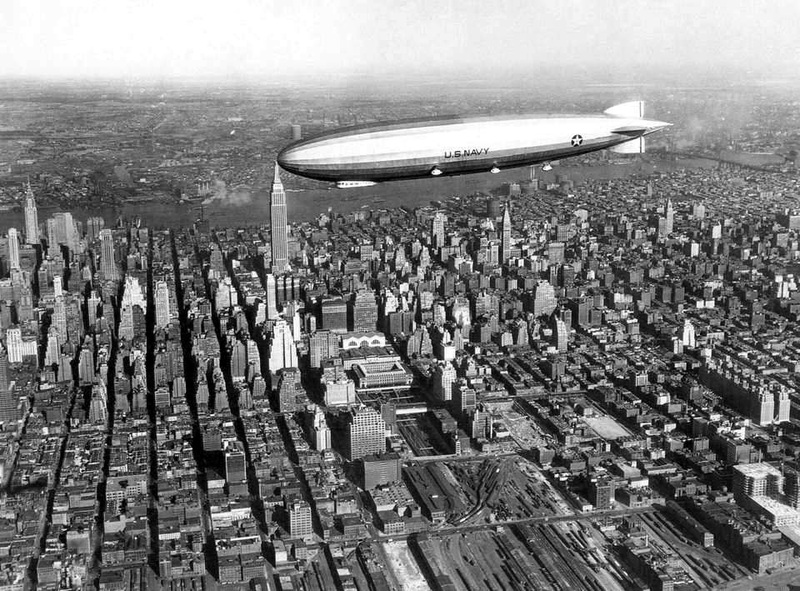 This spans several of my personal interests - flight, New York City, historical architecture, history, dirigibles, clippers - so it's a natural fit for me. 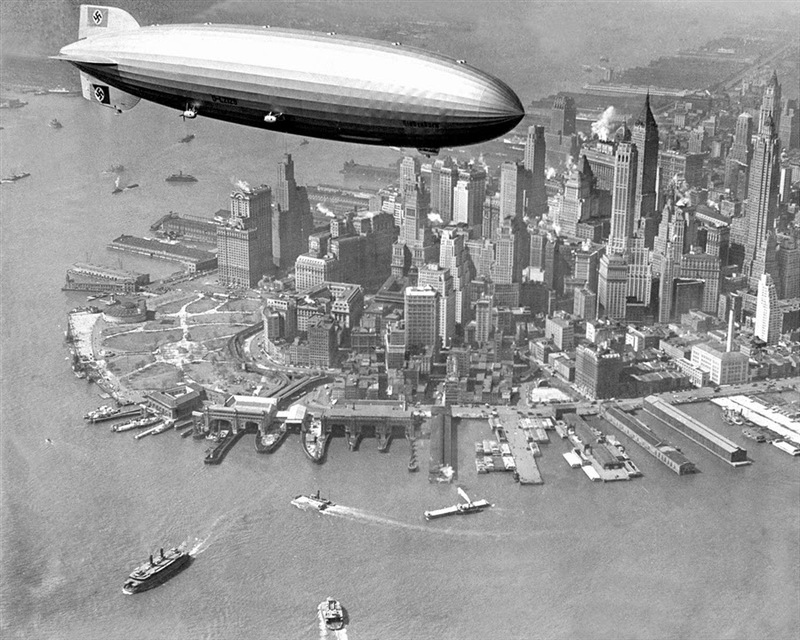 The dirigibles are the German Hindenburg and the USS Macon. 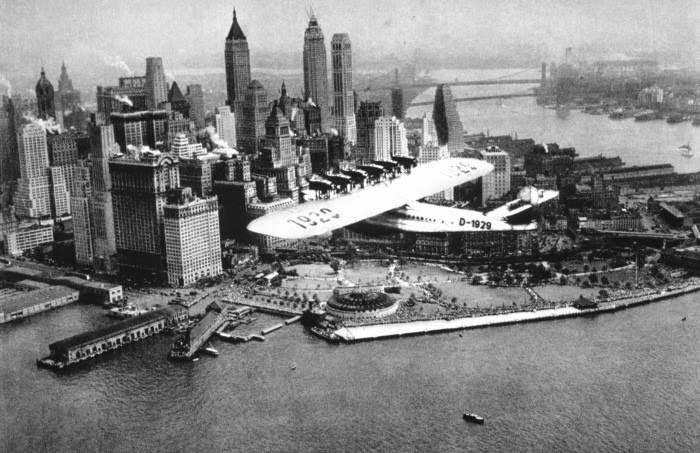 PanAm Clipper Flies Above Manhattan, 1949. 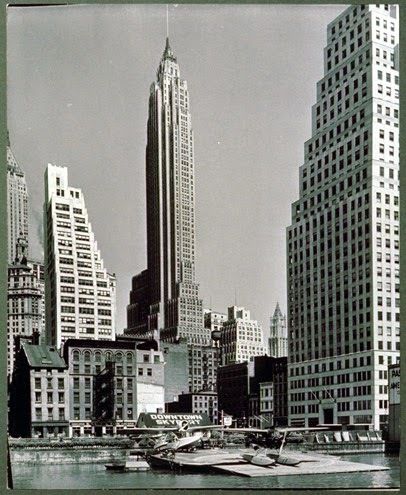 This looks like it came from a newspaper or magazine or maybe advertiser archive somewhere, note the cropping lines. The less of NJ we see, the better! 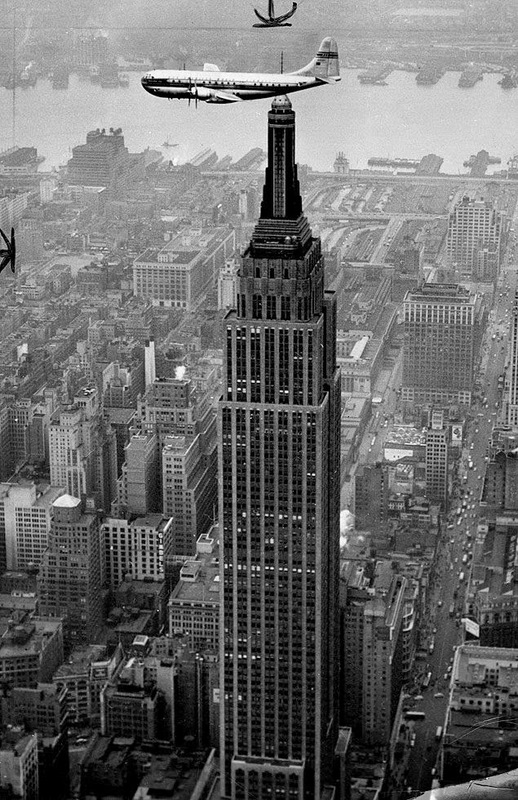 And the Empire State still did not have the tv antennas, but that would change soon. It took a ton of sailors to haul in this beast. 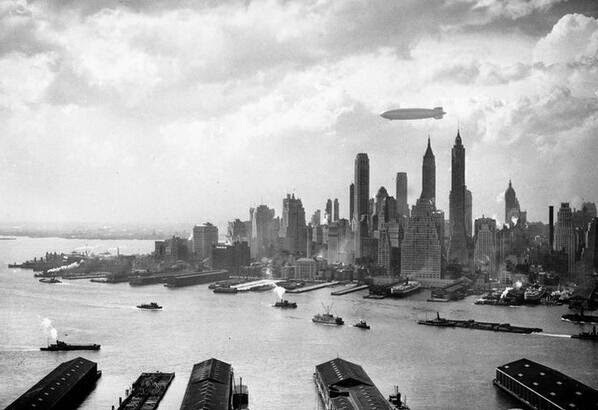 This may have been at the New Jersey landing field where it later burned. Incidentally, notice the Olympic Rings on the side, put there because Germany hosted the 1936 Olympics. 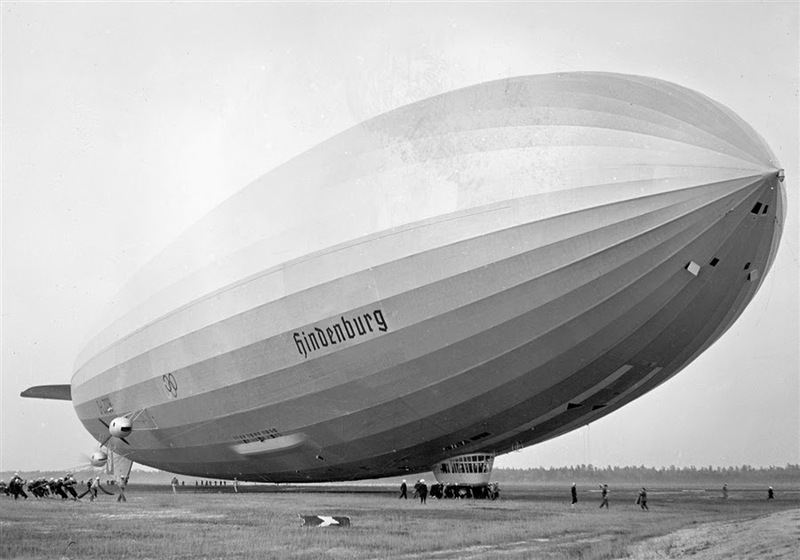 The Hindenburg. 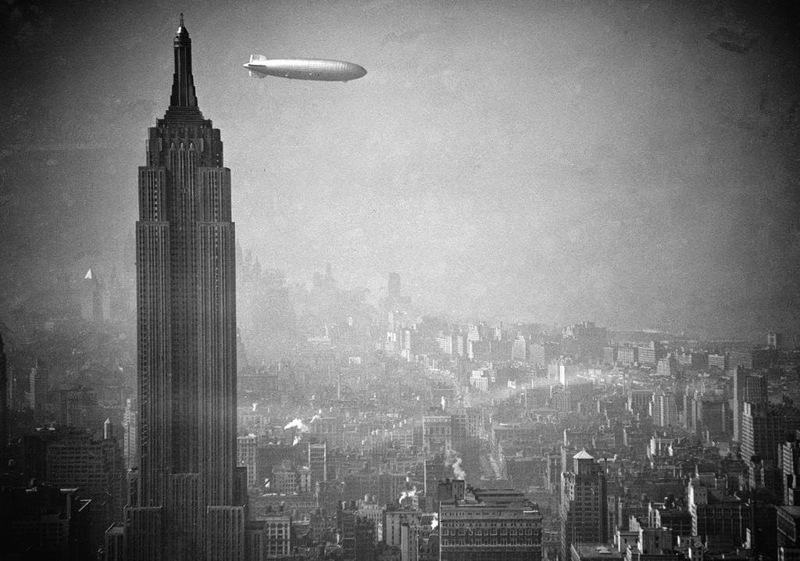 Probably May 6, 1937. 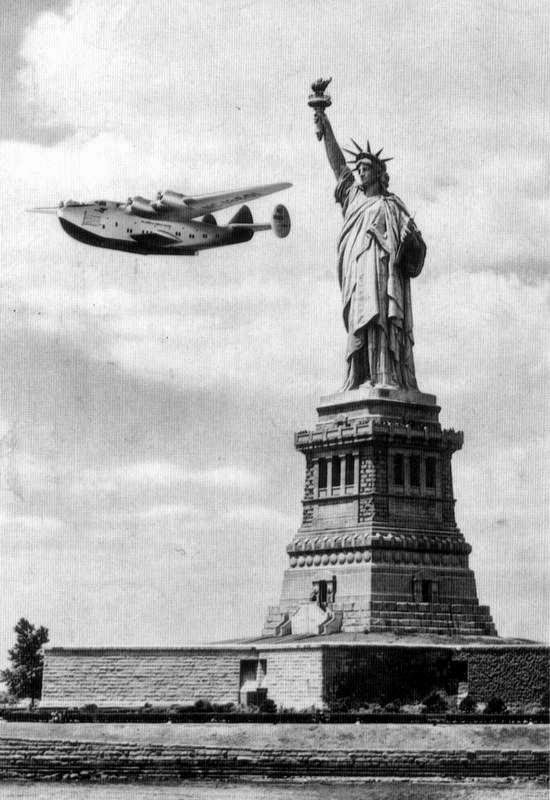 Back when they still had the mooring mast on the Empire State Building, an incredible conception. 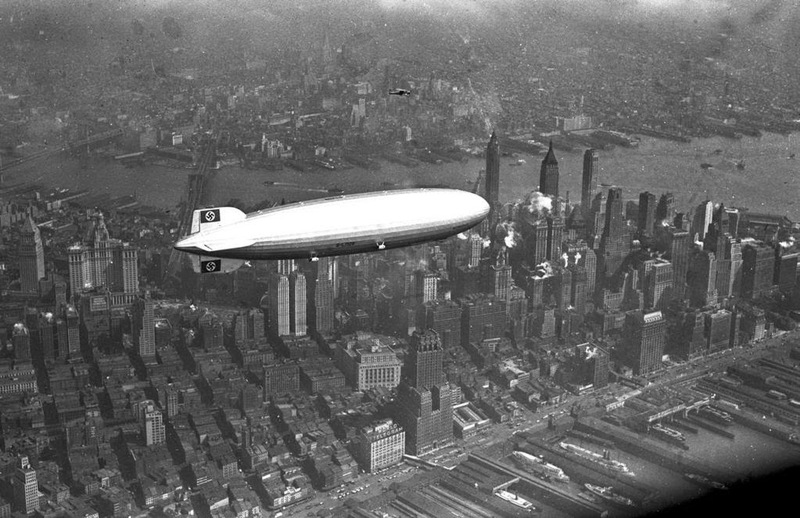 This and the other 1931 shots are of the USS Macon, ZRS-5. 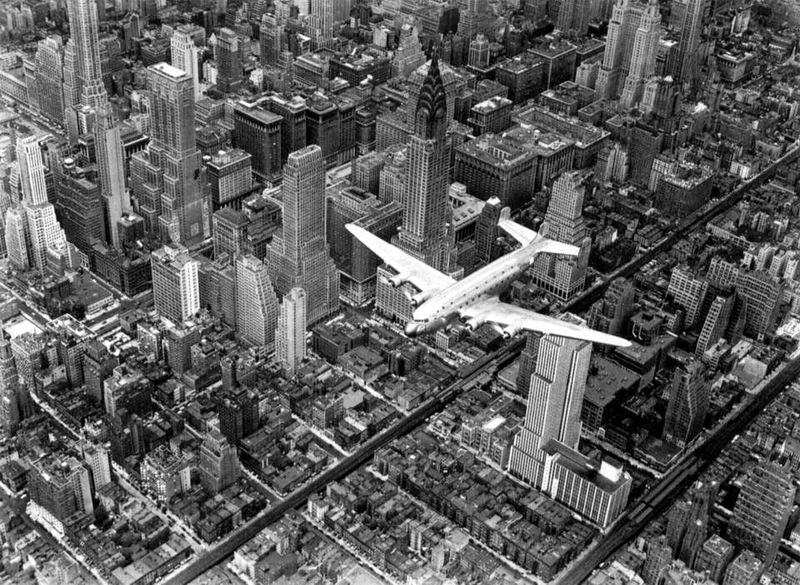 Obviously, Fairchild Aerial Surveys was quite fascinated by the Macon that day and was buzzing around it for hours. 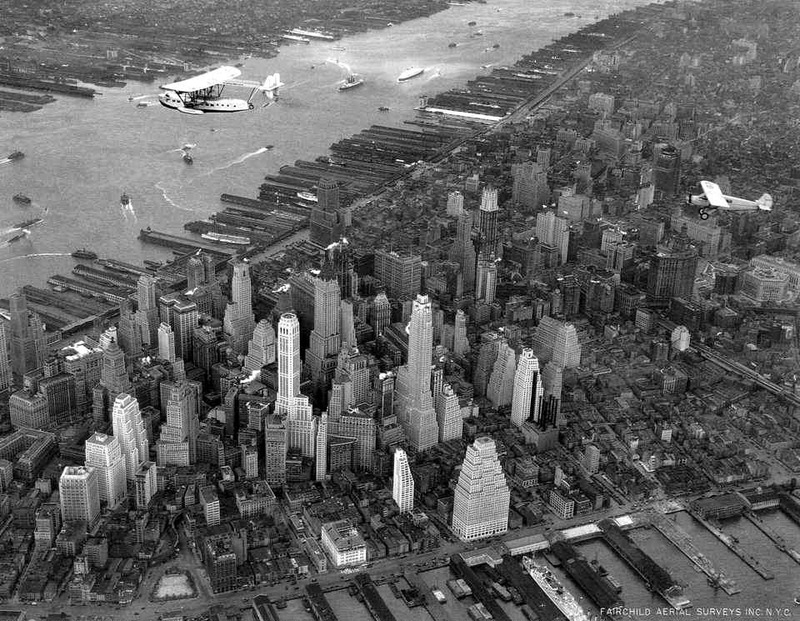 Midtown, 1931. The tracks lead to Penn Station. Post Office spans tracks, may some day be Penn Station. 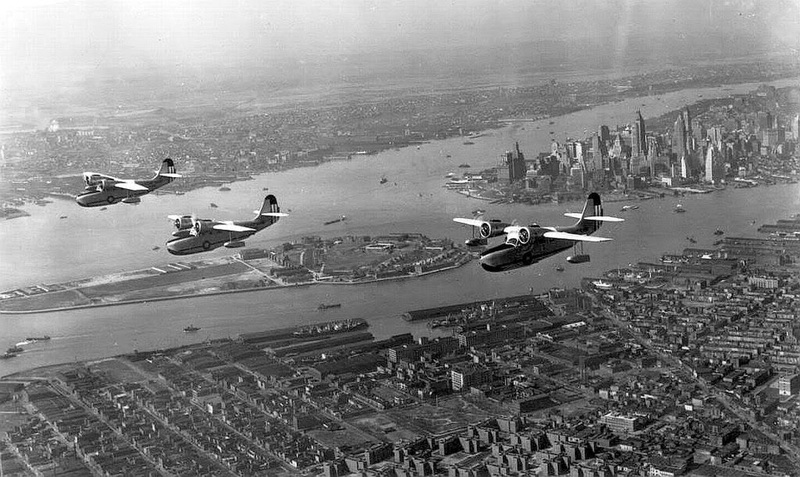 Fairchild. 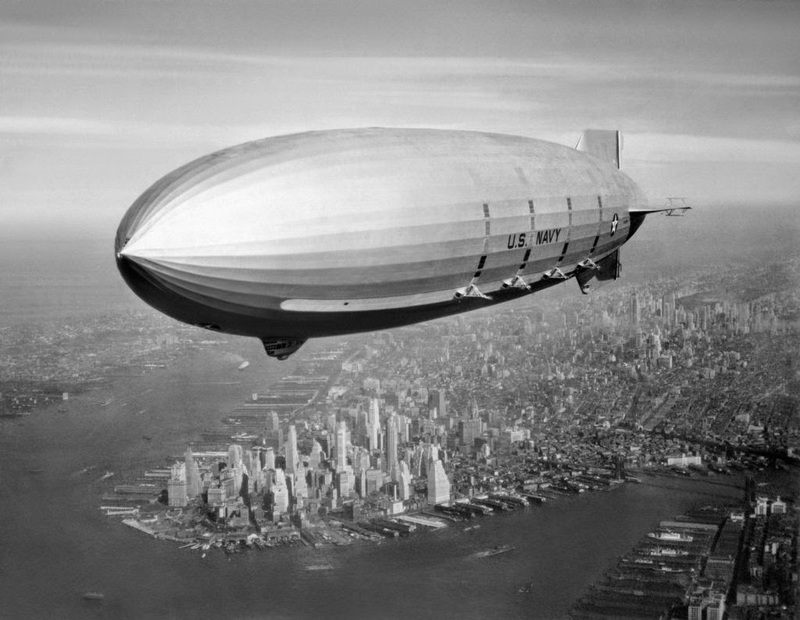 The US Navy Dirigibles generally met horrible ends from inclement weather.